While the Thanksgiving holiday is all about spending time at home, there is a certain freedom that comes with taking the holiday ‘off’ from the kitchen and starting a new tradition with your family & friends. One way to you can do this is by joining The Alfond Inn at Rollins, in Winter Park, at their table for their popular Thanksgiving Buffet on Thursday, November 23rd, 2017. Depending on your family’s preference, you can choose from two seatings at 1 p.m. and 4 p.m. 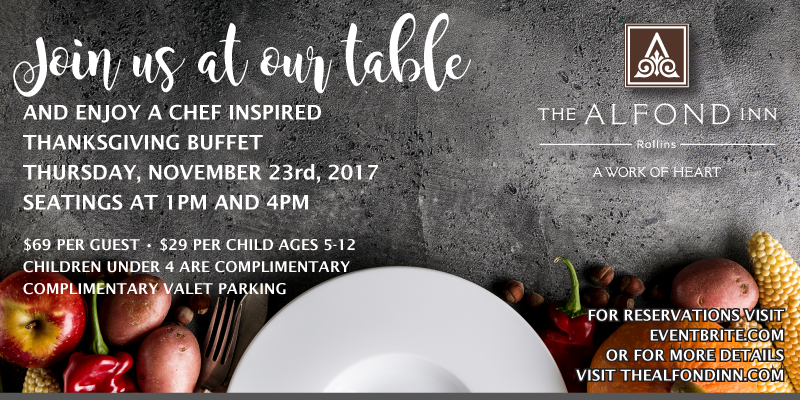 The cost to attend The Alfond Inn’s Chef Inspired Thanksgiving Buffet is $69 adults, $29 children ages 5 – 12, and children ages 4 and under are free. And you will also enjoy complimentary valet parking during your dining experience.